The Miniature Italian Greyhound, also referred to as a miniature Greyhound or simply as an Italian Greyhound, is an intelligent dog and selective in his choice of friends, but bonds closely with those he loves. It is easy to imagine this streamlined dog with its elegant and regal-looking appearance, gracing the palaces of ancient Egypt, where its remains have been discovered in various tombs and their likeness found in ancient texts. This speedy toy dog breed is believed to date back two thousand years or more, though there is reason to conclude that its ancestors originated much at a much earlier period. 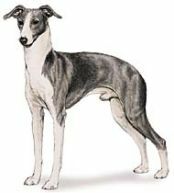 Though not of Italian origin, the Miniature Greyhound came to be a favored pet throughout Roman times where it resided in the households of nobility. It also gained considerable status in nearby Greece and Turkey. By the 16th century its popularity spread to royal households both in England and throughout all of Europe. And it's not surprising that the IGs sleek and graceful appearance was often seen portrayed in famous paintings - regally standing side-by-side with their master. Healthwise, the "grey" has a lifespan of up to 15 years with good care and is considered to be an overall healthy breed. Like a lot of miniature dog breeds, they can be more susceptible to dental woes. Among the diseases that may affect the breed are retinal atrophy and elipepsy. Coat colors include: Fawn, cream, red, blue, or gray, and it may be either solid or with markings. The IG can best be described as sleek and graceful looking. Its large eyes combined with upright ears give this small dog an expression of alertness. The Miniature Italian Greyhound has short hair that requires minimal grooming and there is very little shedding. Use a cloth made of silk or velvet to keep the coat glossy and a damp towel occasionally to keep it clean. This is a clean dog with no doggie odor. However, this breed is sensitive to the cold, doesn't like wet conditions and really needs a coat when a slight chill is in the air. This toy dog breed is more of a one person/one family dog with a loving sweet nature and one who enjoys and expects much affection in return. IGs like to be in charge and can be quite assertive when it comes to acting as the pack leader. They especially do not respond to harsh training methods. Owners need to have a reliable training guide or experienced dog trainer to know how to handle the dominance issue, as well as some reference books on potty training - one area that can take a lot longer to accomplish with this breed. The Miniature Italian Greyhound is fond of creature comforts and cosy couches. Very intelligent, inquisitive, discerning and quick to learn, but can be a tad stubborn. IGs are a high-energy and affectionate small dogs. Both sweet and smart, they will easily wrap you around their paw if you let them! Despite its small size, it is quite a hardy toy dog. See These Cute Italian Greyhound Puppies! IGs enjoy exercise and walks, but always keep them on a leash - these dogs are speedy and can be gone in a heartbeat if they spot a fast moving animal! Then again, for those of you that like to take a run with your dog, their sprinting ability makes them the ideal buddy, if you can keep up! They are also pretty active around the house, but be forewarned, they love to climb and investigate! One thing to keep in mind when going out in either a warm or cold climate, is that the greyhound's coat does not provide much protection from the elements. It pays owners to stay aware of weather conditions that may pose sunburn or hypothermia dangers to their pet, and always take measures to protect the IG on these occasions. Even though The Miniature Italian Greyhound isn't too fussy about his quarters, he is not a dog that likes to be left outside, definitely preferring inside shelter. You might be thinking that would make him ideal for apartment living and while he is very adaptable, he won't be a happy camper without any place to run around outside occasionally or take potty breaks. A better choice, if the Iggy had any say in it, would be a country or slightly rural surburban setting where there is access to trails for taking long walks. Does the Italian Greyhound Like Children? Well he does like them well enough, but because the Miniature Italian Greyhound has a fine-boned and more fragile structure, they are not the best choice for small children who might accidentally injure them during play. This breed seems to do better in more quiet surroundings and with older children who are considerate and sensitive toward pets and can help out with his exercise needs. And of course, when there are children around, the best policy is to have an adult supervise any interaction between them and pets. Is the Iggy A Good Choice For Seniors? That's a definite yes with the condition that they are able to provide for his walks on a regular basis. With such a loving disposition and relatively easy care, the Miniature Italian Greyhound makes an ideal companion for more active retirees and seniors and will enjoy all the attention a stay-at-home family can give him.